This is a take on the perennial favorite pigs-in-a-blanket. Though we have taken the pigs out and added ships. We took the pigs out because, here at May the Fourth, we are talking about Star Wars, not PIGS IN SPAAAAAAAAAAAAACE! Back to the X-Wings. 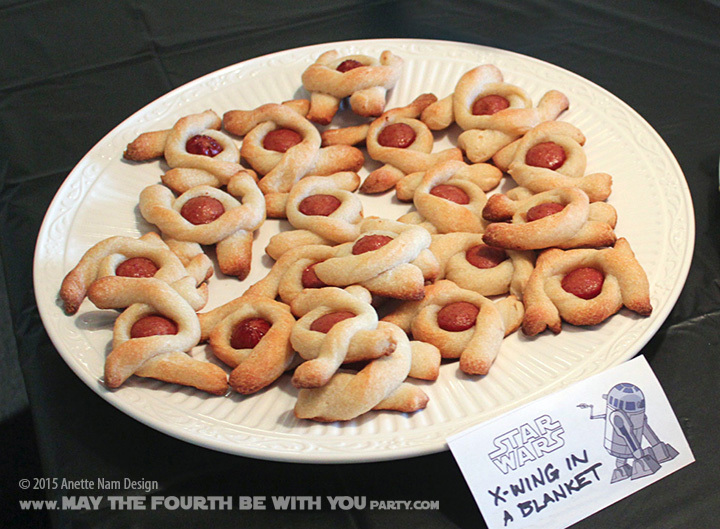 This recipe is originally from the book “The Star Wars Cook Book: Wookiee Cookies and Other Galactic Recipes ” by Robin Davis (the book is a must have for M4Ps). She calls them TIE fighter ties, but ours always end up looking more like x-wings, so we renamed them for our parties. Cut all the bread sticks into 2 pieces. Place hot dog piece on pan, standing up on end. Wrap hot dog piece on 1 side with a piece of dough. Wrap the other side with another piece. Pinch the area where the dough overlaps. If you can, make them all in advance, but do not bake them all at once. They are WAY better hot, and people are grazers. So stagger the baking throughout the party, so there is always a fresh batch.